I was sad this morning to read that Ginny has retired Yarn Along, a Wednesday link-up she has hosted since 2010. Of course, I totally understand her readiness to move on, and I'm sure many of us with continue with Tuesday's Keep Calm and Craft On with Nicole. Still, I will miss the reading element that Ginny brought into our world. 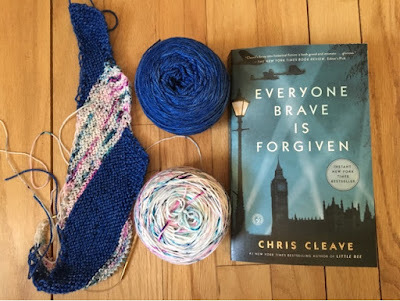 So, it is with bit of sorrow that I post my last Yarn Along, which includes both a new knit and a new book. 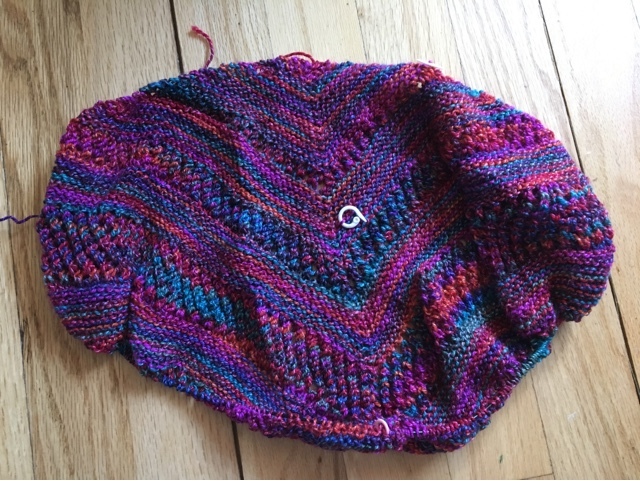 Summer Camp is a shallow and long shawl designed by Laura Aylor. The solid sections are Sun Fiber Valley yarn, and the speckled yarn is from Hedgehog Fibres. Both are yummy and fun to work with. It's designed to be a mindless knit, and it is quite easy. Everyone Brave Is Forgiven follows three fictional Londoners through World War II. Chris Cleave, who wrote Little Bee, takes on a narrative voice that has the ring of history, but I'm not far enough into the book to say if it works. The dialogue sparkles with dry British wit, so I'm encouraged by the first few chapters. Joining up with Ginny to Yarn Along. 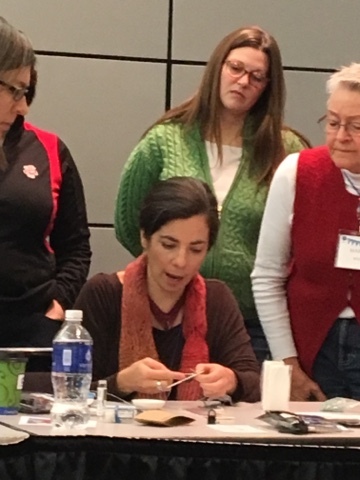 A Class With Laura Nelkin: Swoon! Madison may not be a big city, but it is a big knitting city. 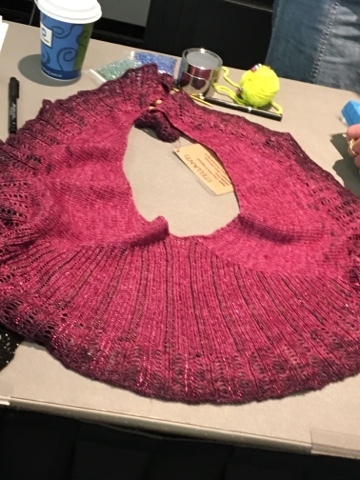 We had our Knit In this weekend, and the line-up of teachers was amazing. 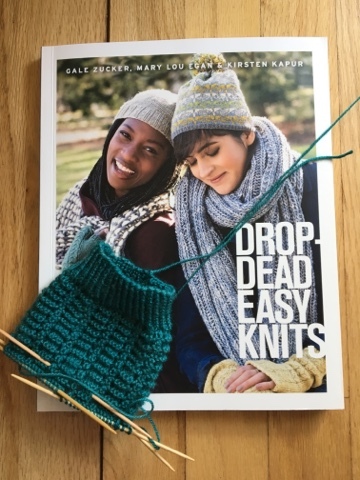 Saturday morning, a friend and I took a class on knitting with bead from Laura Nelkin, author of Knockout Knits. The class was amazing. Did you know that you should never use beads on single-ply yarn? Me, neither. It's not strong enough. Also to be avoided are wool/silk blends and cashmere. 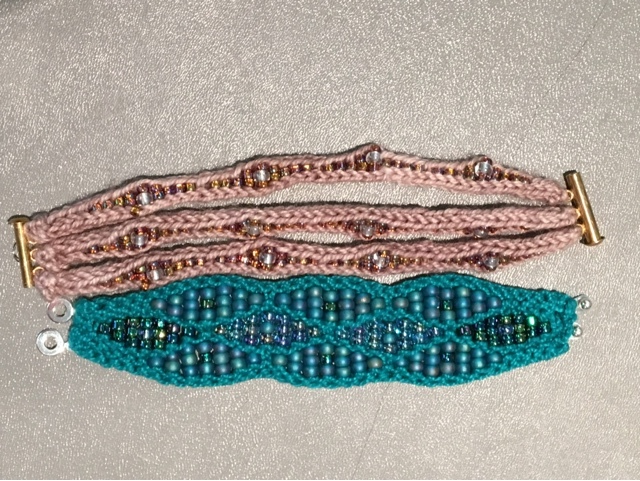 I also learned that you need to use bigger beads when you are placing beads (like with a crochet hook) than when you pre-string beads. This is the Stellanti Shawl, which was our favorite one of her samples. 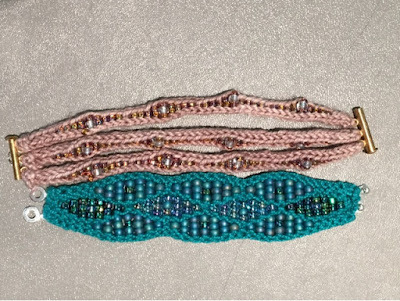 The beaded sections are super easy so this is definitely going in my queue. Nelkin is quite funny. She described more difficult projects as being "anti-Alzheimer's patterns." I do love knitting jewelry, though I haven't made any for quite some time. Nelkin's samples gave me plenty of inspiration. The class was just for a half day, so we shopped after scarfing down some sandwiches from home. It turns out that I am quite the Wisconsin shopper. The two reddish/pink skeins are going into a second Perhaps, Perhaps. They were dyed by Sun Valley Fibers (Mount Horeb, Wis.), and I cannot say enough good things about their yarns. They are stunningly beautiful, a joy to knit with, and hold up well to wear. 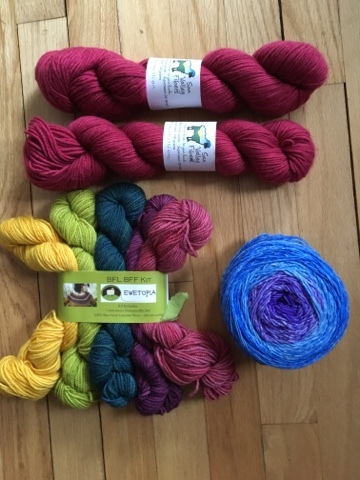 I could not resist the mini skeins from Ewetopia (Viroqua, Wis.). All my favorite colors in one package! I'm looking for the right poncho or shawl pattern. Let me know if you have any ideas -- though I should mention that the yarn is DK weight. Last but not least is the gradient cake in blue and purple, which I bought to make an Antarktis out of, but now I'm thinking it would make a good Stellanti. Such tough choices. !The yarn is by Knit Circus, which is right here in Madison. Yes, I am lucky! This seems like enough for one post, so I'll tell you about fair isle with Mary Jane Mucklestone later! 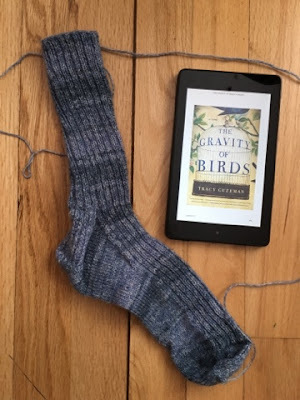 I'm halfway through The Gravity of Birds by Tracy Guzeman. It's OK for popular fiction. The bird theme is woven deftly into the plot, and I appreciate that. If you like popular fiction, you'd probably like this book about two sisters and how their lives are entangled with a famous (fictional) artist. 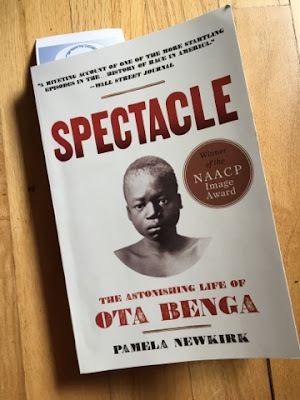 I finished Spectacle: The Astonishing Life of Ota Benga with mixed feelings. I think it's an important story, but most of his story has been lost with the passage of time. The book is padded with lots of unnecessary detail, and I found myself skimming more and more as I went along. 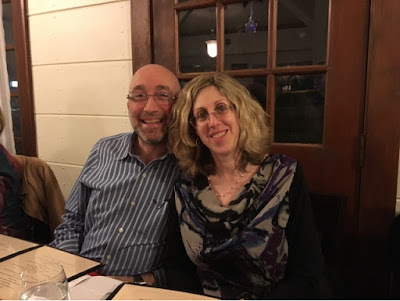 That's my brother Eric and his wife Nancy. They met at The College of William and Mary where both are law professors. It was the first time we got to meet Nancy's family, some of whom live in England, so it was a lot of fun. 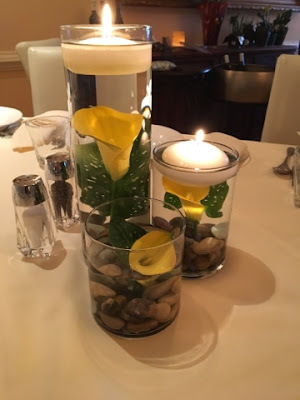 I played a very important role: helping to put together the centerpieces for the wedding dinner. Ironically, my brother found this idea on the Internet...that would be the same brother who used to tease me about "crapbooking." Last laugh is on me! 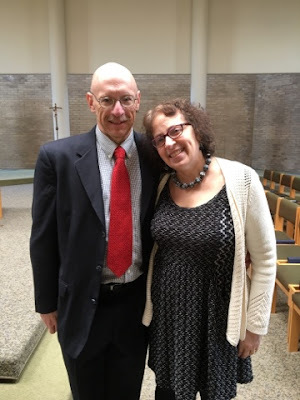 On of my nieces snapped this photo of Keith and I at the church. 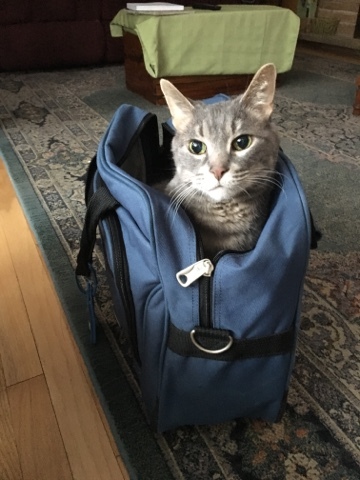 When we got home, Naji made it clear that he wants to go on a trip, too! No, I'm not talking about my marriage. Wait -- that doesn't sound right. Of course, my marriage is monogamous! I have an awesome husband who never comments when I buy yarn; although, he does like to tease me about my stash. Knitting and reading, though, are harder for me to be monogamous with. But in an effort to simplify my life, I'm forcing myself to pick up hibernating projects. This week I pulled out my Reyna. I love this shawl and the yarn includes my favorite colors. However, I am struggling with the netting section I'm working on. The netting keeps changing direction, so matter how careful I am with following the pattern. Sometimes the simple patterns are the hardest! At least for me. And I'm still reading Spectacle by Pamela Newkirk, about an African man who was "taken" from his homeland and displayed at the Bronx Zoo in 1906. I think books like these are important in understanding how race is and was perceived in the United States. I'm joining up with Ginny to Yarn Along. Because I had a few recent finishes, it seemed reasonable to cast on a new sock, Idlewild by Kirsten Kapur in Sun Valley Fibers MCN in the color Jungle. The sock just happens to be from Drop Dead Easy Knits. I don't buy a lot of knitting books because there are just so many and I can't knit that fast. But this one I've looked at for a while. I adore Kirsten's patterns and she has some really good ones in this book. 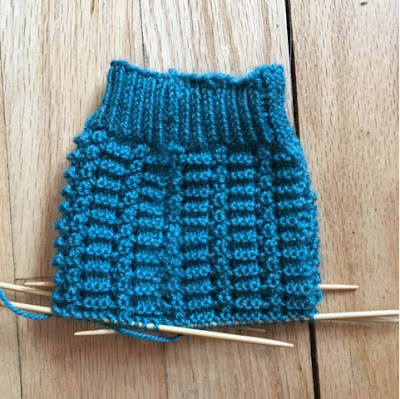 As promised, this sock is pretty darn easy! 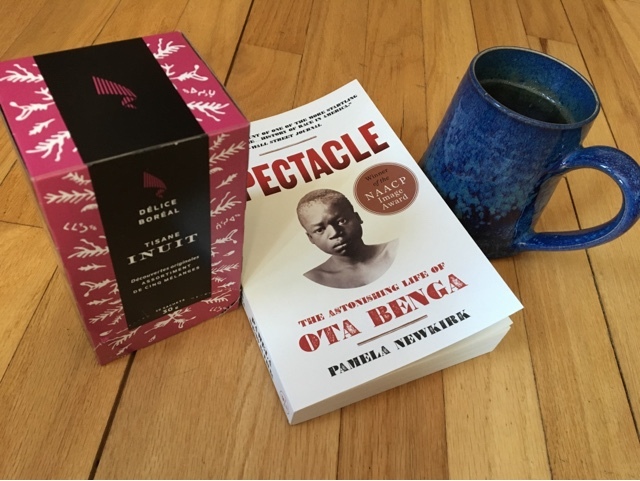 I started reading Spectacle by Pamela Newkirk, which is the true story of an African man who was exhibited at the Bronx Zoo early in the 20th century. Man's cruelty to man never fails to amaze me. Nor does the spirit of people who survive such travails. I've only read about 40 pages, but it's fascinating so far.